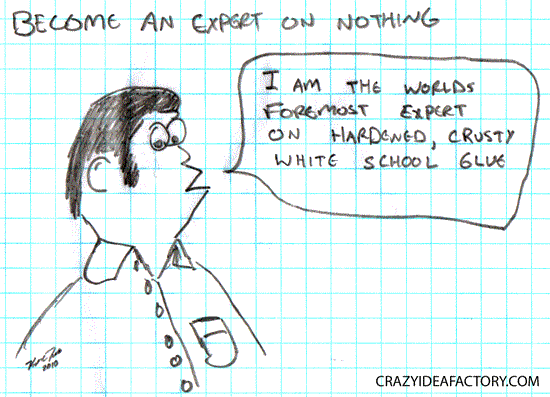 Our friend in the sketch below has devoted his life to becoming the worlds expert on hardened, crusty, white school glue. While many would wonder why one would want to become an expert on such a thing he took the initiative on the subject matter. If he was a real person he could now set up a web page devoted to hardened, crusty, white school glue and you could read all about it and become an expert. Just remember your niche is out there, if you have the drive you can become the worlds expert on such uninteresting things as drying paint, nails that look like potatoes or everybody’s favorite, chewed chewing gum collections.